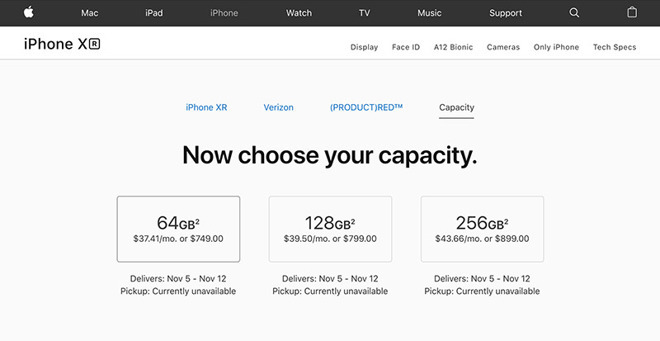 Apple late Monday sold out of launch day iPhone XR supply in the U.S. and beyond, with orders placed through the company's online storefront now showing estimated delivery dates pushed out to November. The online Apple store is showing stockouts of all colors and capacities in Australia, Austria, Belgium, Canada, China, France, Germany, Hong Kong, Japan, Russia, the UK, the U.S. and many other countries where the device was made available for preorder last Friday. Currently, Apple's storefront displays an estimated delivery date of Nov. 1 or "1 to 2 weeks," depending on the region. Initial shipments are scheduled to arrive at customer doorsteps and in Apple retail stores on Oct. 26. The stockout arrives a few hours shy of four full days of iPhone XR preorder availability. Supply of the handset remained steady through the weekend — yellow 128GB units on T-Mobile in the U.S. sold out in less than an hour — but certain models began to pop up as unavailable as stock dwindled on Monday. As usual, the number of units Apple managed to manufacture in the buildup to launch is unknown, though some analysts put the figure at around 12 million. Though the XR launched to seemingly softer demand than its XS series stablemates, some analysts believe the colorful, less-expensive smartphone will ultimately prove vital to Apple's bottom line. Gene Munster of Loup Ventures, for example, expects iPhone XR to be the bestselling iPhone of 2018 with a 38 percent share of shipments. Others, like noted analyst Ming-Chi Kuo, predict better replacement demand than last year's iPhone 8 and better long-term momentum than iPhone XS. While Apple sold through its iPhone XR stock, customers in the U.S. can still grab a launch day unit through partner carriers including AT&T and Verizon, both of which are still showing availability as of this writing.